First and foremost I guess I’ll start with an apology. Usually I use NWTW as something for me to learn bits and pieces about the wines we’re trying. That’s why I send out small blogs each day. I can’t cope with too much info at once, so I try to break it down as best as possible. Problem is it means I send out a blog per day during the week and if I’ve got something on during the week it gets a tad tough. Last week I was out in Bordeaux for the Primeurs tastings. It wasn’t that I was drunk or anything, just trying to speak french all week. For those of you who have to speak languages that aren’t your own for long periods of time you’ll know what I mean. I was either half asleep or in the zone all week. Anything that involved brain function has had to take a back seat til this morning. Hence not many posts this week, so sorry for that! Right, enough of that, it’s Falanghina time! I hope everyone enjoyed their wines this week, and judging from the feedback on twitter that’s exactly what happened. Great to see you guys in the US getting stuck in. I think something very obvious from the outset is that there’s a pretty big price range of Falanghinas out there. The price though really didn’t always give a good nod to the quality available. That’s a good thing. There are some seriously cheap, and seriously good wines out there. I only tried the one this weekend. It was the Bisceglia Falanghina, Terra di Vulcano, from Spirited Wines. My wife suprised me with a seafood risotto for dinner when I got back in from the airport of Friday, so it seemed like fate. We took the chance to crack open the bottle. First thoughts were about the smell. It’s a bit warmer down the South of Italy so I was expecting stone or even tropical fruits. The over-riding smell I got was apricot. Ripe and ready to eat. Absolutely lovely. There was also the classic lemon citrus, and a hint of honey too. I was really looking forward to drinking it. On the taste the flavours from the nose kept on through to the mouth. Big things that came through were about the body, the acidity, and the finish. The body was a lot thicker than I’d thought. I couldn’t smell any oak, so I’m assuming they’ve added texture by stirring in the lees (this is basically all the sediment that comes from fermentation and maturation, if the wine is left “on the lees” and it’s stirred in now and again, it gives the wine more body). The acidity was medium in scale, I guess this is a nod to how hot it is over there. The finish was long in length, but with over-riding taste of stoney minerality. A really good drop of wine. What can I say about the food pairing? Made for each other. Seafood risotto. Creaminess of the risotto with the parmesan cheese, the slight sprinkling of lemon juice, the minerality of the mussels and squid. Ah it was perfect. Then straight over to the couch to fall fast asleep. I’m nothing if not a romantic! Top week, really enjoyed the wine, a strong 7/10. #NWTW Week 13: Never Heard of Falanghina? 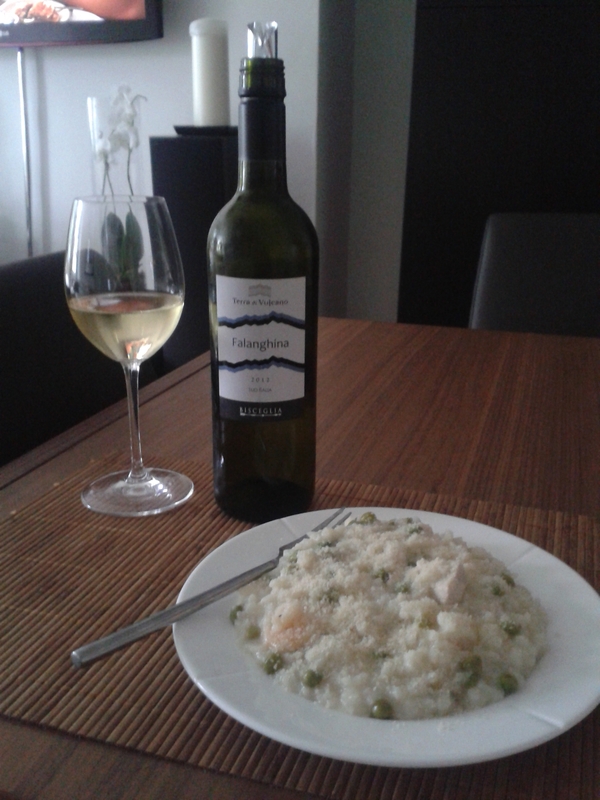 ← #NWTW Week 13: Never Heard of Falanghina?